The successful story of the iGEM Team Munich continued. 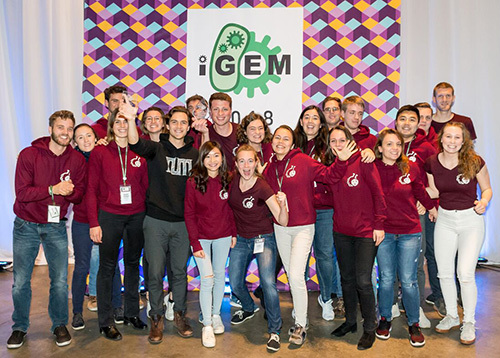 Again, initiated by the Research Training Group GRK2062 „Molecular Principles of Synthetic Biology“, the combined iGEM team from the two Munich universities LMU and TUM has received the 2018 1st Runner Up Prize Overgrad in the international iGEM competition at Boston (MA) on October 29, 2018. With the help of concepts from synthetic biology they created Phactory, a cell-free molecular assembly line for bacteriophages to overcome the lack of common manufacturing procedures which meet international quality and safety standards. Their development may push forward the worldwide implementation of bacteriophage therapy - a 100-year old treatment employing the natural enemies of bacteria. Compared to traditional manufacturing procedures, Phactory requires 2.5% of the production volume and demands no special biosafety regulations to yield bacteriophages ready for therapy. Furthermore, Phactory received special awards in the category "Best Manufacturing Project", "Best Entrepreneurship", "Best Presentation", "Best Software" as well as "Best Wiki". This work wouldn’t be possible without the help of Prof. Dr. Friedrich Simmel, who hosted the iGEM team in his laboratory at the TUM in Garching, Prof. Dr. Gil Westmeyer and Prof. Dr. Kirsten Jung, who gave scientific advice and the UnternehmerTUM, who helped with their network. Beside them the team also received financial support by the LMU, the TUM, the GRK2062 and also from industrial sponsors. Project: Antimicrobial resistance is a major emerging threat as reported by the WHO. Worldwide implementation of bacteriophage therapy, a 100-year old treatment employing the natural enemies of bacteria, is impeded by the lack of common manufacturing procedures which meet international quality and safety standards. Based on synthetic biology we created Phactory, a cell-free molecular assembly line for bacteriophages. We demonstrate expression of several phages including T7, MS2 and 3S at clinically relevant concentrations. Exploiting the open nature of cell-free systems, Phactory enables modular composition of bacteriophages with engineered proteins while remaining GMO-free. We developed a quality control structure utilizing state-of-the-art bioinformatics, as well as purification and encapsulation protocols. To expand our production variety while reducing cost, we optimized and engineered home-made E. coli cell-extract. Compared to traditional manufacturing procedures, Phactory requires 2.5% of the production volume and demands no special biosafety regulations to yield bacteriophages ready for therapy. Congratulations to all members, to the supervisors as well as to the sponsors of the team!